Has your plant manager told you the existing facility won’t handle the additional volume? Does the sales team want the plant to be closer to key customers for faster service? Has finance recommended a move to a more affordable space? Well, buckle up – it’s time to prepare for a plant relocation. Here's a road map to guide you as you collaborate with your plant engineering team and your contractors to get your plant relocation completed. Review and update facility and equipment layout drawings. This map and inventory of your plant and current equipment helps you understand what needs to be moved out and how to move it into the new facility. Spot check details such as equipment size and quantity, building column placement, utility location, presence of pits and trenches and aisle sizes. And note items that may not show up on layouts such as cranes or conveyors. Identify assets to move to the new facility. Create a spreadsheet or database listing equipment you plan to move. Use a tagging system to label any equipment lacking a clear identification number. During this process, note the condition of the equipment – this helps you decide if the cost to relocate and repair equipment is more than the cost to replace. And your notes will be helpful to assess equipment condition after the move. Evaluate the utility and structural requirements. Your team will need to verify the utility installation plan is correct, and coordinate with structural engineers about overhead requirements for cranes, monorails, tooling rails and conveyors. Develop a transport and shipping plan. The new location will affect how equipment is packaged – longer distances, for example, may mean equipment needs to be dismantled and shipped in pieces, and may need to be packaged to withstand the journey. Decisions should be also made about whether to relocate the plant in increments, sequencing equipment moves over time or maximize cost efficiency by completing the move all at once. Create a plant relocation schedule. A timetable will start evolving as you work through the initial steps of the plant relocation. The schedule may include time to ramp down production at your current facility and ramp up at the new location, which could affect the sequence of equipment transferred to the new site. Your contractor should be able to work with you on a realistic timetable that considers your internal timelines and your budget. Provide equipment relocation instructions. When working with contractors, be sure to provide information about disconnecting, dismantling, cleaning, crating, loading, protecting, shipping, unloading and startup of the equipment after the move. Include the equipment list and drawings prepared earlier to help your teams verify the relocation happens as planned. When choosing a contractor to support your plant relocation, use this checklist to find a specialist who can provide the level of service you need. Does the contractor have experience with complex relocations, including disassembling, moving, transporting, reassembling and installation of equipment? What types of facilities are available for loading? Is storage available and if so, is it indoor, outdoor, or both? Does the supplier have strong partnerships with mechanical and electrical contractors for moves involving boilers, transformers and switchgears? Is precision equipment available to move fragile and valuable machinery? Can the contractor customize equipment and technologies to meet your needs? Although we’ve shared the major activities involved with plant relocation, we understand facility moves can present challenges. Having our relocation team stand shoulder to shoulder with you throughout the process can help you find solutions to the unexpected and course correct for success. Need industrial crane service and specialized transportation, or help with a turnkey relocation? 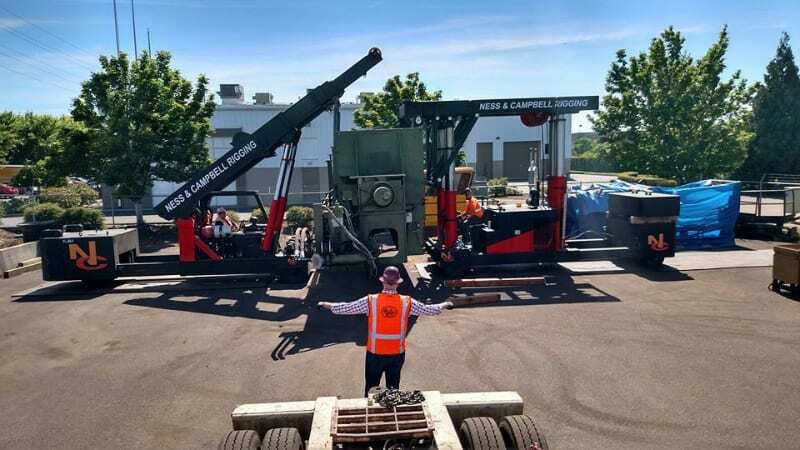 Contact NessCampbell Crane and Rigging – whether you move 1 mile or 100 miles, we’ll get the job done right, from start to finish.